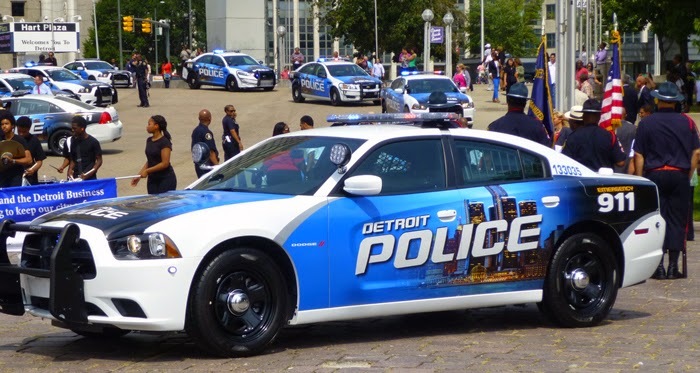 Two Detroit police officers are accused of robbing drug dealers and stealing drugs and money obtained in police searches. According to the The United States Attorney's Office Lieutenant David Hansberry, 34, and Officer Bryan Watson, 46, each were charged with conspiracy to possess with intent to distribute narcotics, conspiracy to interfere with commerce by robbery, multiple counts of interference with commerce by robbery and extortion, possession with intent to distribute five or more kilograms of cocaine and two counts of possessing a firearm in furtherance of a crime of violence and drug trafficking crime. A third defendant, Kevlin Brown, 45, was charged with one count of interference with commerce by robbery and extortion. According to the US Attorney, the officers -- while wearing their uniforms and in police cruisers -- would make traffic stops and fake arrests, then steal drugs, money, and personal property from their victims. The indictment also claims that Lieutenant Hansberry, who has been a cop for 16 years, and Officer Watson, who has been on the force for 22 years, didn't log evidence money and drugs seized. Instead, they split the cash and arranged to sell the drugs and share proceeds. The two officers were previously assigned to the now-disbanded Narcotics Section of the Detroit Police Department. They both have been suspended since October 2014. Meanwhile, in NYC ... another narcotics officer stole $3,000 in cash during a raid on a Brooklyn deli. According to police, Det. Ian Cyrus, 49, is under investigation by the Internal Affairs Division and District Attorney’s office. The officer was at the deli participating in a raid looking into the sale of untaxed cigarettes and surveillance cameras at the shop caught him pocketing money during the raid. He has been suspended without pay.